If using crescent rolls: Unroll dough. Separate dough crosswise into 2 sections. Press dough to form 2 squares, firmly pressing perforations to seal. If using dough sheet: Unroll dough. Cut crosswise into 2 sections. Press dough to form 2 squares. Place 1 square on cookie sheet. Cut cheese crosswise into 2 equal layers. Place bottom half of cheese on center of dough square on cookie sheet. Spread jelly over cheese. Sprinkle with chopped cilantro. Top with remaining cheese half. With small cookie or canapé cutter, cut 1 shape from each corner of remaining square of dough, and roll 3 small pieces of dough to form 3 balls; set aside. Place square of dough on top of cheese round. Press dough evenly around cheese. Fold bottom edges of dough up over top edges; press to seal. Brush dough with beaten egg. Top with cutouts and dough balls; brush with additional beaten egg. Bake 20 to 30 minutes or until deep golden brown. Cool 15 minutes before serving. 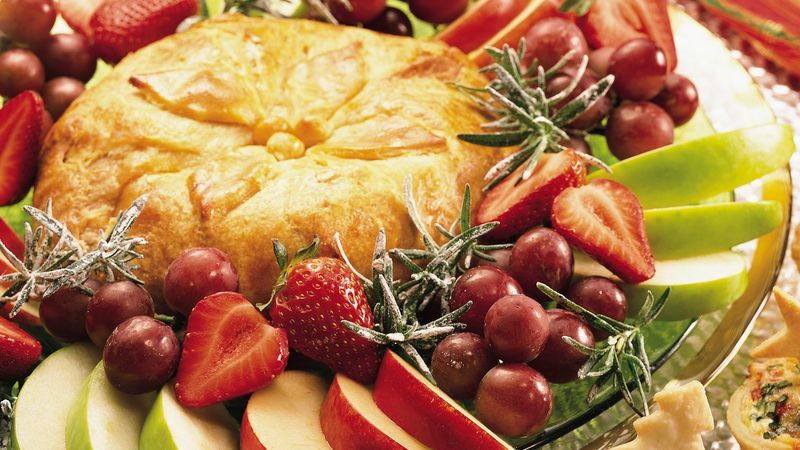 To serve, place warm pastry-wrapped cheese on platter. Arrange fruit around cheese. Garnish with cilantro sprigs.